Prospective homebuyers looking to settle down in an area with a long, rich history, should consider the real estate in Lynn, Massachusetts. Lynn’s history stretches back thousands of years and includes a rich heritage of several indigenous tribes. During the pre-Colonial period, the Naumkeag tribe was the dominant population controlling the area, their territory existing primarily in Essex County. The first wave of Europeans settled in the area around 1629. Edmund Ingalls led the charge and is considered the founder of Lynn, though the community was originally incorporated as Saugus. Tanning leather and shoe production were for what Lynn was known. In fact, during the Revolutionary War, the Continental Army’s boots were made in Lynn. Along Lynn’s Atlantic coastline in the mid-1800s, resorts, beach cottages, and large luxury estates were constructed. This led to the area becoming a popular summer vacation destination. Today this area is known as the Diamond Historic District. While Lynn’s coast was being developed, industrial growth was taking place further inland. In addition to shoe manufacturers, Lynn became the home of the newly formed General Electric company in 1892. From the late 1800s through the early part of the 1900s, the city experienced tremendous growth with an influx of immigrants nearly tripling the population, taking it from 9,800 to almost 30,000 people. Though an undeniable global leader in shoe production, Lynn began to see a decline in its shoe manufacturing throughout the 20th century, and in 1981 its final shoe factory closed its doors. However, in the early 2000s, the city began to see major revitalization including the renovation and repurposing of historical buildings as well as new construction. Today that revitalization continues as vacant industrial structures are repurposed into lofts, apartments, shared workspaces, and offices. Now home to nearly 90,000 culturally diverse residents, Lynn is the largest city in the county, on the Atlantic coastline, just nine miles north of Boston. The city is situated on the northern shore of Massachusetts Bay with Lynnfield and Saugus to the west, the Atlantic Ocean and Swampscott on the east, Salem and Peabody to the north, and Revere and Nahant to the south. 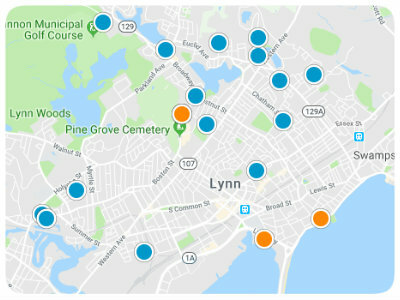 Beyond this rich history and fabulous location, Lynn encompasses many exciting attractions including Gannon Municipal Golf Course, Lynn Memorial Auditorium, Manning Field, Frasier Field, and Pine Grove Cemetary. With so much to offer, the city is definitely worth the consideration of prospective homebuyers. Lynn real estate includes condominiums, townhouses, luxury homes, historical properties, and single-family homes of varying shapes and sizes. If you would like to learn more about homes for sale in Lynn, Massachusetts, please give us the opportunity to help you in your home search by contacting us today.